This is an interesting and practical iPhone stand that measures approx 4.5 inches deep x 5 inches wide x 3.5 inches tall. As shown in the image, the simple iPhone dock is shaped as a cute, cartoonish shark along with exquisite details, and its custom holder keeps your iPhone in portrait mode and works with iPhone 5/5s and iPhone 4/4S. Moreover, its open mouth and internal chamber serve as a passive audio amplifier that boosts iPhone volume without batteries or electricity to +15 bB. 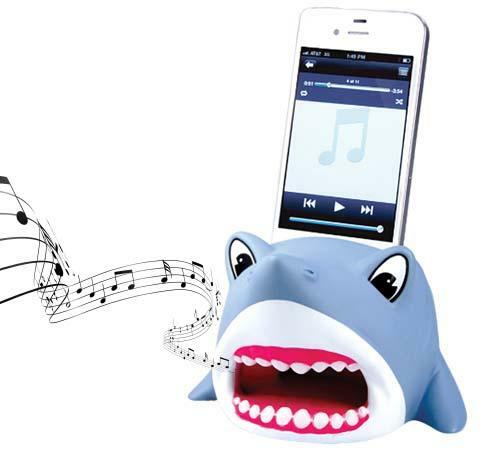 The shark iPhone stand with audio amplifier is priced at $13.99 USD. If you need it, jump to Perpetual Kid online store for more details. Additionally, if you need other options you might like to check the vintage audio amplifier for iPhone 5/5s and more via following tags.